Raisins can contain up to 72% sugars by weight, most of which is fructose and glucose – forming sucrose when combined in a single molecule. They also contain about 3% protein and 3.7%–6.8% dietary fiber. Raisins, like prunes and apricots, are also high in certain antioxidants, but have a lower vitamin C content than fresh grapes. Raisins are low in sodium and contain no cholesterol. Pre-treatment is a necessary step in raisin production to ensure the increased rate of water removal during the drying process. A faster water removal rate decreases the rate of browning and helps to produce more desirable raisins. The historical method of completing this process was developed in the Mediterranean and Asia Minor areas by using a dry emulsion cold dip made of potassium carbonate and ethyl esters of fatty acids. This dip was shown to increase the rate of water loss by two- to three-fold. Recently, new methods have been developed such as exposing the grapes to oil emulsions or dilute alkaline solutions. These methods can encourage water transfer to the outer surface of grapes which helps to increase the efficiency of the drying process. The three types of drying methods are: sun drying, shade drying, and mechanical drying. 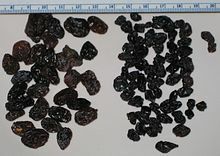 [further explanation needed] Sun drying is an inexpensive process; however, environmental contamination, insect infections, and microbial deterioration can occur and the resulting raisins are often of low quality. Additionally, sun drying is a very slow process and may not produce the most desirable raisins. Mechanical drying can be done in a safer and more controlled environment where rapid drying is guaranteed. One type of mechanical drying is to use microwave heating. Water molecules in the grapes absorb microwave energy resulting in rapid evaporation. Microwave heating often produces puffy raisins. Raisins offered for sale at a market in Taliparamba, India. Raisins are rich in dietary fiber, carbohydrates with a low glycemic index, and minerals like copper and iron, with a low fat content. Raisins are often recommended as a snack for weight control because they help the control of glucose, the good functioning of the digestive system and the regulation of blood pressure. Replacing unhealthy snacks with raisins as a dietary habit has shown positive benefits in patients with type 2 diabetes, including reduced diastolic blood pressure and increased levels of plasma antioxidants. Corinthian raisins are a moderate glycemic index fruit that can be consumed in small amounts even by diabetic patients instead of sweets. Antioxidants in Greek raisins may reduce the risk for malignancies in the stomach and colon. Raisins have one of the highest concentrations of boron in dried food, containing between 2 and 3 mg per 100 grams. Boron may be important for maintaining healthy bone and joint quality. It has been shown to disadvantage testosterone synthesis. According to a study published in “Journal of Agricultural and Food Chemistry”, golden raisins have a higher antioxidant capacity than sun-dried black raisins do. ^ Dom Costello. "Kew Gardens explanation". Royal Botanic Gardens, Kew. Archived from the original on 5 September 2012. Retrieved 16 January 2013. ^ "currant". Oxford English Dictionary (3rd ed.). Oxford University Press. September 2005. (Subscription or UK public library membership required.) Entry at "currant": "'raisins of Corauntz n.' (also called 'raisins of Corinth')". 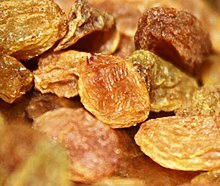 ^ "Types of Raisins: Currants, Golden Seedless, and More". Berkeley Wellness. Remedy Health Media. Archived from the original on 21 September 2017. Retrieved 20 September 2017. ^ "Nutrition Experts & Dietitians » California Raisins – The Wise Choice". California Raisin Advisory Board. 22 February 1999. Archived from the original on 15 January 2012. Retrieved 16 January 2013. ^ Bays, Harold E.; Schmitz, Kathy; Christian, Amber; Ritchey, Michelle; Anderson, James (2012). "Raisins And Blood Pressure: A Randomized, Controlled Trial". Journal of the American College of Cardiology. 59 (13): E1721. doi:10.1016/S0735-1097(12)61722-7. Lay summary – ScienceDaily (26 March 2012). ^ a b c d Christensen, L.P., and Peacock, W.L. (20 April 2013) "The Raisin Drying Process" Archived 12 June 2013 at the Wayback Machine. Raisin Production Manual, University of California at Davis. ^ "Boron (EHC 204, 1998)". International Programme on Chemical Safety.